My goal for the Interstate was to try to find its natural place in the world, in other words to see what it was best at doing. 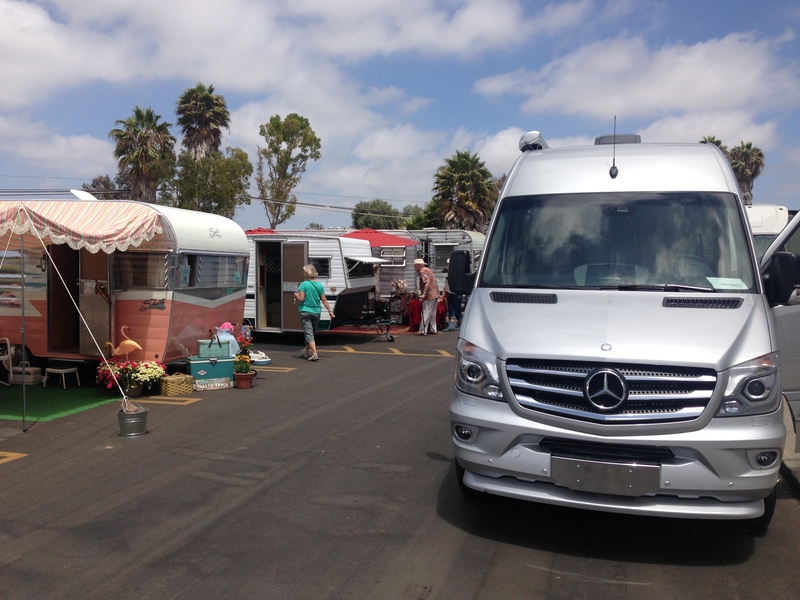 Having pulled a 30-foot Airstream travel trailer all over southern California, I had the opportunity to compare experiences and go where the big trailer couldn’t. There was a problem with this great plan, however. June 28, my first day, was also the first day of a holiday week. In my part of the world people don’t begin celebrating July 4 until at least July 2, but the Californians apparently feel differently. They crowded every available campsite from San Diego to San Francisco for the entire week and I discovered my chances of getting a nice spot anywhere near the ocean were virtually nil. Had I not had several years of experience at finding alternative overnight stops, I might have given up right then and headed inland to the scorching desert. No problem getting campsites in places where the temperature is running 110 degrees or so. But I wanted to experience the coast, so it was time to call on every resource I had. My Saturday night stop was easy. I just stayed parked at the Murphy Auto Museum overnight. I hadn’t planned to spend the first night without hookups, but it seemed like a good chance to test all the Interstate’s systems. Sunday morning I took a drive up to Ojai, then wandered down to Santa Barbara on country roads past orchards and ranches, staying off Hwy 101 for as long as possible. That’s one of the nice things about the Interstate compared to a travel trailer. 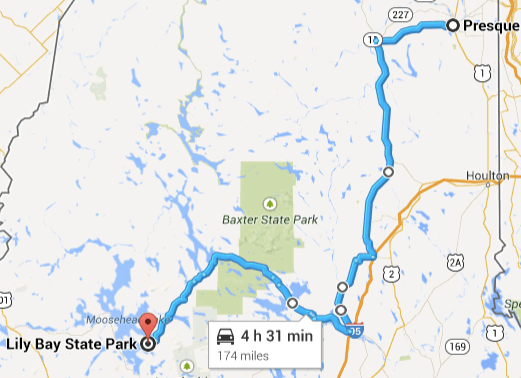 I didn’t have any hesitation about trying narrow, winding road that might eventually force me to make a U-turn. Twenty-five feet of motorhome isn’t exactly compact, but it’s a breeze to turn around compared to 53 feet of truck and trailer. In Santa Barbara I got my first tank of diesel. Turns out the Interstate has the same fuel capacity and slightly better fuel economy than my GL320, so it was a familiar experience, and not nearly as traumatic as I had feared it might be. At the fuel station I got the first of many inquiries about the Interstate. This is not a stealthy vehicle. People can’t help but notice it, and quite a lot of them will ask questions or even hint for an interior tour. 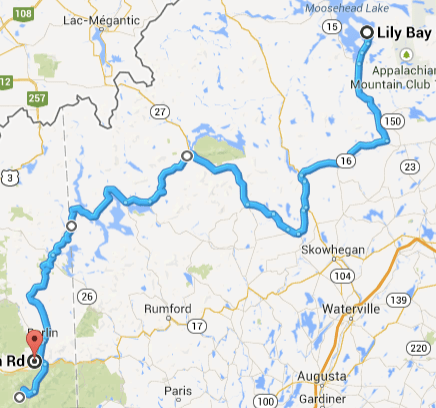 I ended up giving 15-20 tours over the course of ten days. People want to know what it costs and what fuel economy it gets, and then they are often amazed to find that it has a full bathroom with shower. A little further up the road I saw a sign for El Capitan Beach State Park and decided to drop in there, just to park in the day-use area for a while. For $9 I had this spot for the entire day, and it was a truly beautiful day. I opened all the windows, broke out a cold drink and a snack and a book, and settled in for a while. I could hear people walking by and saying, “That’s a cool van!” and similar comments. With the blackout windows and the day/night shades in “day” position, they couldn’t tell I was in there. Later, when I felt like company, I slid out the big side door and got a spontaneous visitor about every twenty minutes. One guy claimed the Interstate cost $300,000. Another was so excited he went back to get his wife and kids for a second tour. One woman got in, then gave me a look that said Uh-oh, I just got in a van with a strange man, but stayed for the tour anyway and then got her husband and friends. Lots of people took photos of themselves next to it. 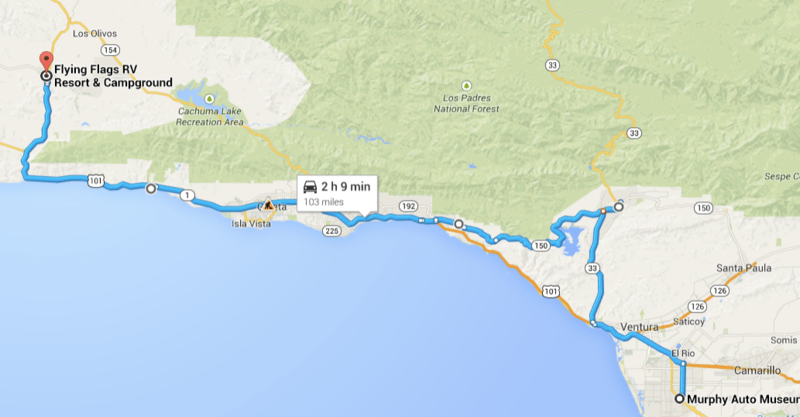 I couldn’t spend the night here, so I wandered further up the coast on the PCH, ending up in Buellton. There’s a good RV park there that I figured was far enough inland to maybe have a site available, and that turned out to be a good guess. $63 with taxes reminded me that I was indeed in California. Well, I needed a chance to hook up and try out all those systems too. The full hookup site gave me a chance to try the fancy new macerator dump that the Interstate uses (no more stinky slinky) and I was favorably impressed with the neatness of the system. I found a small water leak coming from the rig but it turned out to be just a dripping P&T valve on the water heater. That’s an overpressure protection valve, and it’s a common issue that is easily rectified, but I just let it drip because it’s not significant and I didn’t expect to be using the water heater much. This evening I tested the video system by playing a movie on the Blu-ray DVD and both LCD TVs. With a Bose active noise-cancellation headset plugged into the headphone jacks (by the second row seats), I couldn’t hear a thing from outside nor the vent fan humming above my head, and I got totally immersed in the movie. This Interstate experience was starting to feel very decadent, especially compared to the two weeks I just spent on a motorcycle. I was beginning to think that after ten days it might be hard to give the thing back. After the motorcycle trip in Quebec I only had a week to get ready for the next trip. I don’t expect you to sympathize with me, if you like to travel. Having to rush around and re-pack between exciting trips is the way I would be happy to spend the rest of my life. Really, re-packing is easy and takes little time, especially since I had months of advance knowledge of the trips. The important tasks have to do with family and work. My wife is always my partner in travel even when I’m traveling without her, but if we have been apart it’s a high priority to spend some time together. You can only connect so much via email, phone, and the occasional video chat. It’s just as important to share a dinner, or go grocery shopping, or any other routine thing. The same goes for my teenage daughter, who probably noticed I was gone but was too busy to worry about it. Even if she didn’t pine my absence, the comfortable assurance that comes with sharing day-to-day life can’t be replaced any other way that I know of. It was especially important in this case, because I was gone for nearly two weeks and now I’m embarking on another trip that will have me away for a month. After years of trying, Airstream and I finally managed to coordinate the loan of an Airstream Interstate touring coach. I’m going to take it from Los Angeles and get to know it as intimately as possible, over a period of 10 days. 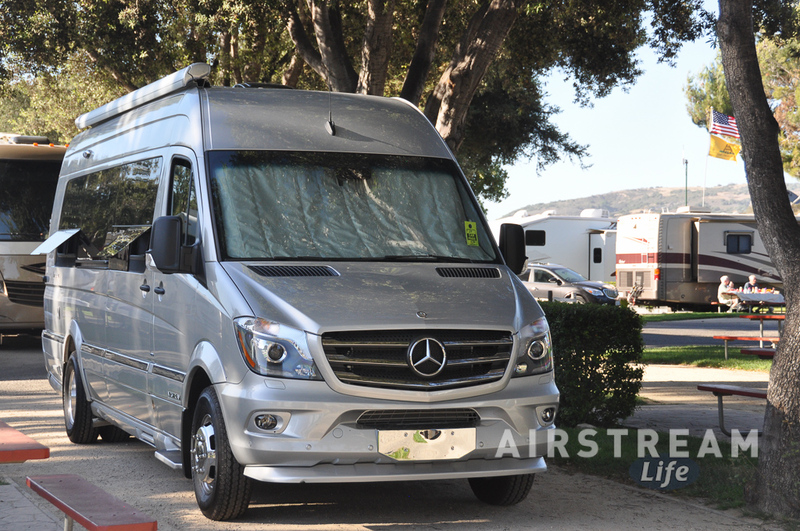 I flew from Vermont to Los Angeles on June 27 and spent an uninteresting night at an airport hotel before being picked up by Victor, who is currently the finance guy at Airstream of Los Angeles. Victor is a 19-year Airstreamer and has apparently been a fan of Airstream Life magazine for years, so we had a lot to talk about on the hour-long drive over to San Gabriel in morning traffic. I got a quick tour of the impressive Airstream of LA facilities with Wes Nave, General Manager, and then a ten-minute walk-thru of the Interstate’s systems with one of their service guys, and they handed me the keys and wished me luck. I have to admit I was a bit stunned. This moment had been years in the making. The Interstate was standing there, ten feet tall and 25 feet long, gleaming in metallic silver paint, with the big Mercedes logo on the front and AIRSTREAM on the sides and back. It looked confident and expensive, and it is—$150,000 worth of German automotive engineering and American RV design layered together. I’ve driven some expensive rigs and pride myself on being able to drive just about anything, but with the keys in my hand for 10 days—no questions asked—it took a moment before I gathered myself enough to actually climb into the driver’s seat. Even worse, somebody had kept the Owners Manuals, so I didn’t have any help from Mercedes-Benz or Airstream (at least in print) figuring out the systems. But I didn’t actually mind this because most new owners don’t read the manuals anyway, and so my experience would be closer to that of the average person. Because this was a “media” loaner, the PR people had outfitted the Airstream with a bunch of “camping” equipment, which was nice but made me chuckle a few times. The flashlight, dish soap, sponge, towels, tank deodorizer, and bed linens were great. The hammer, 300-pack of paper plates, jumper cables, and massive frying pan—not as much. The frying pan was about twice the size of the two tiny burners on the SMEV stove, and the automotive reporters who typically take this media loaner out aren’t generally going to be cooking beans over a campfire. You don’t really need jumper cables since (if the starter battery is dead) you can press a button on the dash to use the coach’s auxiliary battery for extra juice. I don’t know what the hammer was for. I was actually pleased that the Interstate came with a few basics, because I knew I would need to get stuff for the rig right away, and at least my list was shorter by about six items. But going to the grocery store seemed like a dull way to start the trip, and soon afternoon traffic would be building up, so if I was going to get out of LA County easily, it was better to make tracks now and shop later. Eighty-five miles of stop and go traffic from San Gabriel to Oxnard taught me a few things. 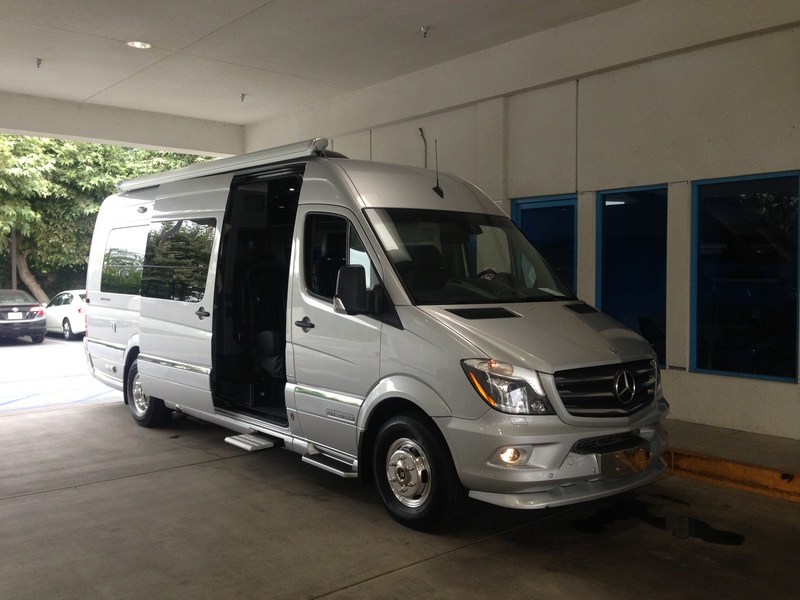 That Mercedes-Benz Sprinter 3500 EXT chassis is really sweet. Airstream ordered it with a bunch of premium options including suspension upgrades and a bunch of neat safety items (like lane-keeping assistance). It’s really easy to drive, and the 6-cylinder diesel is super-torquey. Most importantly, it has great brakes. I learned that over and over as I worked down the Ventura Freeway. My first stop was at the Murphy Auto Museum in Oxnard. My friend David Neel runs the place, and he had invited me to bring my ’68 Caravel to join in a special weekend vintage trailer show. He was a bit surprised when I showed up in a 2015 Airstream Interstate motorhome, but since Airstream of LA had helped sponsor the event we rolled the Interstate right into the middle of a bunch of 1960s Shastas, and I spent the rest of the afternoon showing it to everyone. Well, that’s not all I did. David gave me a tour of his museum (small, but lots of fun, open weekends only, $9 admission), and of course I checked out some very cool rigs outside in the show. 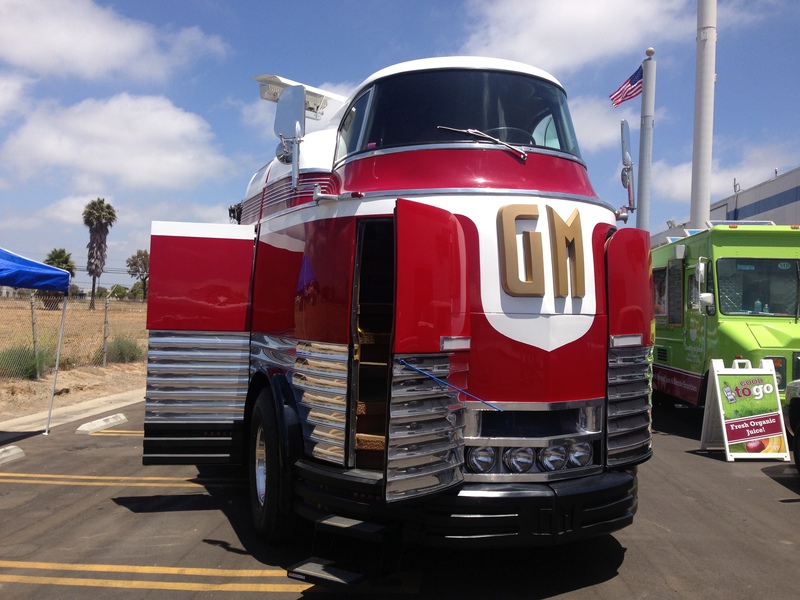 The big star was this rare GM Futureliner, and there was also a sweet 1949 Greyhound bus converted by a boat builder into an RV in the late 1950s. 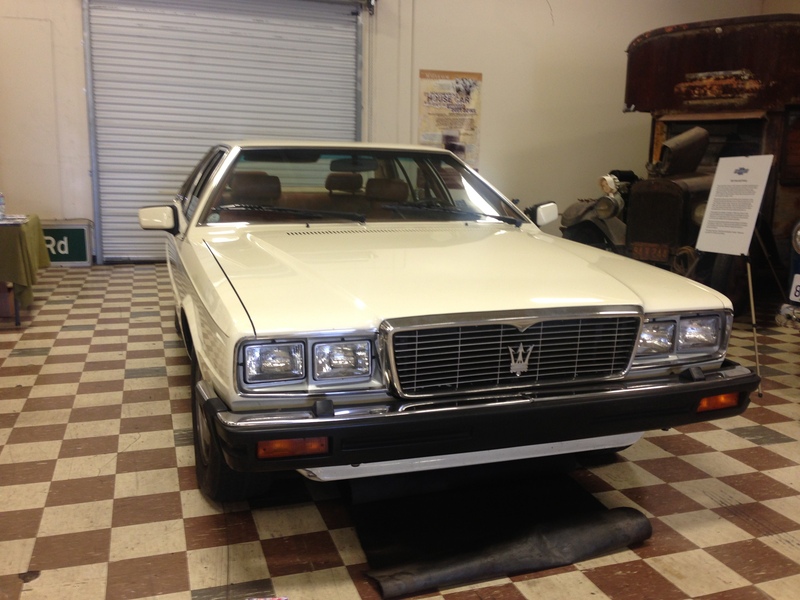 That evening, David offered me the keys to the museum’s 1984 Maserati Quattroporte III, to go do my grocery shopping. Sheesh. With great reluctance (ha!) I took the keys and had a very fun evening driving a Maserati to Wal-Mart, and then to meet David’s family in Oxnard for sushi. What a rough day. First Airstream gives me their top-of-the-line touring coach, and now I get a Maserati to run my errands in. To be honest about my tribulations, David did mention that the car had $20 worth of gas in it, which in California is less than five gallons, and it is a Maserati (did I mention that already?) so it was iffy how far I’d get on that amount of fuel. But hey, if I had to put another twenty bucks to cruise the 101 in southern California on a beautiful evening, it was going to be well worth it. Feeling sorry for me yet?